Preheat the oven to 190°C, gas mark 5. 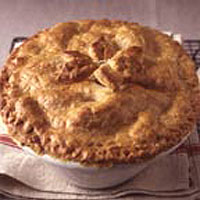 Put a pie funnel, if you have one, in the centre of a 1.25-litre capacity pie dish. Put the apples, sugar, water and spice in a pan. Bring to a simmer and cook for 5-10 minutes to soften the apples. You don't want them to collapse. Place in the pie dish. Roll out the pastry. Cut a 1cm-wide strip and press on to the rim of the dish. Dampen this with water, lay the remaining pastry on top, press the edge to seal, then trim off excess pastry. Decorate with pastry leaves, brush with glaze and bake for 30 minutes until golden. Serve warm with cream.